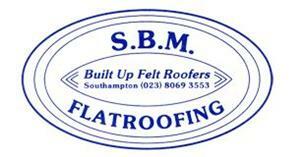 S B M Flatroofing Ltd - Roofer based in Fair Oak, Hampshire. We are a local family business and have been trading for over 30 years. The majority of our enquiries come from personal recommendations. All work is carried out to the highest standard of workmanship, using only quality materials. We specialise in High Performance Mineral Finish Torch on Felt Membranes, and also Evalon-v Fleece Backed Single Ply Membranes. We offer free estimates and advice. Our extensive flat roofing service includes repairs and replacement roofs on garages, extensions, dormer windows, sheds, mobile homes, flats, flat roofed residential houses, commercial premises, and includes re-decking, insulation upgrades and fascias/guttering as required. Work is guaranteed. We are fully insured, and are a registered Waste Carrier. Our prices are competitive and our small team are always friendly, polite and tidy.